"We saved the Line From Being Broken"
"These Were Days of Horror"
Last year marked the 130th anniversary of the end of the Civil War, the single most significant event in all of American history. Since the war's end, nearly 65,000 books have been written on the subject and new ones, examining every imaginable aspect of the conflict, appear every year. Only Jesus Christ has been written about more than Abraham Lincoln. Indeed, Sir Winston Churchill once said that the American Civil War provided him with two of his most cherished heroes, Lincoln and Lee, one for his consummate political skills, the other for his military genius and of course during his own life-time Churchill combined both fields of endeavor by serving his nation as both soldier and statesman. Until recently the most neglected area of civil war studies had been the exploration of the role of blacks in both the North and the South. However, the appearance of the award-winning film, "Glory", provided audiences with the opportunity to learn that nearly 200,000 blacks served in the Union Army and nearly 40,000 of them gave their lives in only two years of fighting since northern blacks did not become participants in armed engagements until the Spring of 1863. To date no similar film is in production that examines the service of blacks in the army of the Confederacy. Blacks have fought bravely in virtually all of America's wars. During the Revolutionary War, more than 5,000 blacks served in the Continental Army under the command of General George Washington who praised them profusely for their military prowess and patriotic spirit. A memorial to these valiant men (who all rejected the British government's offer to grant them their immediate freedom) for their service was approved by Congress in 1986 and will soon be unveiled on the National mall located between the Washington Monument and the Lincoln Memorial. At the decisive battle of New Orleans, during the war of 1812, general Andrew Jackson, later to become president, publicly declared that the black troops that served in his units proved themselves to be some of his most fierce fighters. These earlier black patriots, all of whom must have searched deeply within themselves before making their choice, knowing fully well that their courage and commitment might receive neither recognition nor reward, nonetheless, they served and sacrificed. In essence they made themselves the noble forebearers of the Colin Powells of to day. The invention of the cotton gin in 1793 made slavery immensely profitable (for a short while) but it also quickly produced a surplus population of black labor. With this new technology, one black could effectively perform the work of ten. What then does an owner do with the remaining nine, but mostly idle, workers? Does he destroy them? No, of course not. After all, they are "living pieces of human property" and therefore still very valuable. Surely, most masters, especially the more enlightened among them, had quickly discovered that the vast majority of blacks were intelligent and quick-learners of language and other skills and thus many field hands were transformed into master craftsmen in carpentry, masonry, textiles, ironworks, etc. In 1822, the colony of Liberia, on the west coast of Africa, was created by the American Colonization Society, co-sponsored by the U.S. government, as a homeland for those free blacks who wished to return to their ancestral soil. Only a few thousand blacks chose to be repatriated back to Africa for the simple reason that most, whether they were slaves or free, living in the North or the South, had come to see America as "home" and more importantly they had further come to see themselves as Americans of African descent and not as African-Americans as so many do today. So, as the Civil War era began to dawn, like whites, blacks too were forced to select sides. The issue for them was somber but rather simple, either they chose to fight to preserve the Union (where they were treated at best as second-class citizens) or to fight to establish a new southern nation entirely independent of the Union, where they might possibly become accepted as social equals. If blacks could fight for George Washington, it stands to reason that they could fight for Jefferson Davis just as well. To complicate matters further, let us not forget that the Civil War was not begun to destroy slavery. Uncle Tom's Cabin was published in 1852. Slavery was not abolished in the nation's capital until ten years later on April 16, 1862. By then the war had entered its second year. Furthermore, the final draft of the Emancipation Proclamation was not authored until September 22, 1862, only five days after the Union victory at Antietam. However, the Proclamation did not go into effect until January 1, 1863. It was essentially a presidential "Executive Order" which was cautiously designed not to include the slave-holding border states of Delaware, Maryland, Missouri, and Kentucky (to prevent them from having any incentive to join the confederacy) and would not become the "law of the land" until the war was over and the Proclamation was transformed into the 13th Amendment to the Constitution in 1865. Although President Lincoln was passionately opposed to slavery, he was also a southerner who had married into a prominent slave-owning family, the Todds of Kentucky. Three of his brothers-in-law died fighting against him during the war. While campaigning for president, he repeatedly reminded his audiences that he would not contribute to the expansion of slavery into the western territories, but neither would he employ the powers of his office to bring about slavery's extinction. As far as he was concerned, "It can stay where it is, as it is." After Lincoln's inauguration and the outbreak of the war shortly afterwards, he often stated that if he could preserve the Union by freeing all the slaves he would do it. Equally, he felt that if he could preserve the Union by freeing none of the slaves he would also do that. Thus, for Lincoln the preservation of the Union was first and foremost the ultimate goal of the war. All else was secondary. After all, lest we forget that when the president took his oath of office, the man holding the Bible was U.S. Supreme Court Chief Justice Roger B. Taney, a slave-owning Marylander who presided over the 1857 "Dred Scott" decision which effectively concluded that no blacks had any rights that whites were required to respect. One can only imagine the thoughts of each man as they looked into the other's eyes at the moment of political triumph and impending national tragedy. Fredrick Douglass had never met Abraham Lincoln in person but he knew him well from what he saw of his thinking on paper. Lincoln knew Douglass also through his writings, which greatly impressed him. Also, his Vice President, Hannibal Hamlin, always spoke highly of the self-educated runaway slave who had become one of the country's most prominent authors and orators. He was a man that Hamlin encouraged the President to meet with so that they could get to know each other better. In a sense, no pun intended, Douglass was a "carbon-copy" of Lincoln. Both men began from lowly socioeconomic origins and through a rare and rich mixture of talent and tenacity they became the leaders of their respective people, one by election, the other by acclamation. 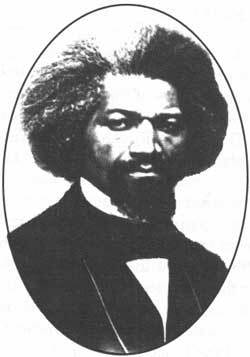 Fredrick Douglass was nine years old when Thomas Jefferson died in 1826. At that young age he had already discovered the wonderful world of words and was beginning to make himself into the voracious reader that he would later become. His reading interests carried him into the distant lands and time of ancient Egypt and classical Greece and Rome. He was thoroughly familiar with the writings of Homer, Plato, Aristotle, Plutarch, and Tacitus, and he was equally well-versed in his understanding of classical literary works and theatrical productions. His temperament and tastes also led him to develop a love of William Shakespeare and the great thinkers of the 18th century European Enlightenment. Above all, he was a great admirer of the Old and New Testament. As a young abolitionist working with many militant New Englanders, he would often fire up many a mixed race crowd by railing against the rank hypocrisy of the Declaration of Independence. In his early manhood, Douglass held Jefferson in very low regard because while Jefferson declared that "all men are created equal" he still continued to own slaves. However, as Douglass matured in his judgements and read more deeply into Jefferson's writings he came to see how uncomfortable that he was for being a slave owner, that he knew it was wrong for one man to own another and thereby deny him his god-given freedom. "Four score and seven years ago our fathers brought forth on this continent a new nation, conceived in liberty, and dedicated to the proposition that all men were created equal." A score is twenty years so subtracting eighty seven years from 1863 takes us to 1776, the writing of the Declaration of Independence, not to 1789, the ratification of the Constitution. Douglass continued to raise black soldiers for the Union Army promising the President that his "sabel arm" would help to bring him victory. Indeed, two of his own sons served in the 54th Mass. Infantry Regiment which was commanded by Colonel Robert Gould Shaw who died leading his troops in the valiant assault on Fort Wagner on the South Carolina coast in July, 1863. After the fall of Fort Sumter, President Lincoln offered the command of soldiers he was raising to suppress the rebellion to Colonel Robert E. Lee. It was a perfect choice. Lee had been in the U.S. Army for nearly 35 years. His father was General George Washington's Chief of Staff, his wife was Washington's step-granddaughter. He was a hero of the Mexican War, former Superintendent of West Point, and the capturer of John Brown during his ill-fated raid on the federal arsenal at Harpers Ferry in 1859. But Lee, whose family helped to found the Union, refused the President's offer to preserve it. Thus having rejected Lincoln to continue as his Commander-and-Chief, he immediately retired to his 1,100 acre residence at Arlington where he subsequently resigned his commission. The Civil War was largely an American "tale of two cities", Washington vs. Richmond, and a titanic struggle between two opposing armies, the Army of the Potomac vs. the Army of Northern Virginia. These enormous forces in the field were commanded by two of the nation's greatest generals, Grant and Lee. They had fought beside each other in Mexico and now were forced to fight against each other in the epic battles that would determine forever the fate of the nation. Virginia was the most important Confederate state. It is where 60% of all Civil War battles were fought. And it is Virginia's soil that sired the nation's leading founders and gave us four of our first five presidents: Washington, Jefferson, Madison and Monroe. With their capital moved from Montgomery, Alabama to Richmond, Virginia, the confederates could make the claim that they were not "rebels" but revolutionaries, that it was they, not the Unionists, who were the true sons of the founding fathers of 1776. After all, upon defeating England the thirteen new states voluntarily entered the Union and thus they reserved for themselves the right to voluntarily exit from the Union. Such was then the very essence of the controversial concept, "state's rights", the right for a state to not have to surrender its sovereignty. Therefore, from the South's perspective, the North was forcing it to stayagainst its willin the Union and such coercive and "illegal" force must be resisted at all costs. The North must not be allowed to "enslave" the South to the Union. Thus the voice of Virginia's Patrick Henry could once again be heard throughout the South, "Give me liberty, or give me death." Throughout the Civil War, Virginia represented the Confederacy's first "domino", should she fall, it was widely believed, the remaining states would quickly follow. Also, Virginia was the industrial heart of the South. In the Spring of 1861, the state had a population of approximately 1,500,000, of whom one-third were black (nearly 60,000 of whom were free). Clearly, such a large segment of the population had the potential to influence events in this most crucial and severely-tested state. Virginia's blacks served the Confederacy as laborers in the fields and factories; half of the workers at Richmond's famous Tredegar Iron Worksthe arsenal of the Southwere black. Blacks served as messengers and miners, teamsters and tailors, butchers and bakers, and as soldiers and sailors. Black labor constructed the 105 buildings of the South's chief medical center, the Chimborazo Hospital complex and were indispensable to its many and myriad medical activities. Relative to most southern blacks, a large portion of those in Virginia were literate and had been educated and trained by their masters to become masters themselves in many crafts and technical trades. This proved to be a tremendous resource of talent and skill that the state could marshal for its defense. The greatest contribution of blacks to the confederate cause occurred during the long and costly Union siege of Petersburg, Virginia, the gateway to Richmond. During the long struggle beginning in June of 1864, black Union soldiers armed with bullets and bayonets were opposed by black confederate soldiers and workers armed with shovels, hammers, and axes. The confederate fortifications were so formidable that Petersburg survived until its capitulation on April 2, 1865. Throughout the war in Virginia, contrary to what many northerners thought and hoped would happen, there were only a few examples of black efforts to sabotage the confederate cause, yet they had it in their power to wreak wholesale havoc throughout the South. Black uprisings would certainly have forced the confederate government to pull badly needed troops from the lines to provide police protection for farms and families under threat of destruction. Furthermore, at any time during the war, especially after the Emancipation Proclamation went into effect, blacks could, with attendant risks, have escaped to nearby Union lines but few chose to do so and instead remained at home and became the most essential element in the southern infrastructure of resistance to northern invasion. Over the years I have read the letters of many southern deserters and I have yet to discover a single one from a soldier who said that the reason he left his unit in the field was because he feared that rampaging blacks on the homefront would exploit the chaos and do harm to his farm or family. It still remains a mystery to many in the North as to why so many blacks remained loyal to the South. Contrary to conventional wisdom, companies of black militia were widespread throughout the South prior to the war. For example, Charleston, New Orleans, Lynchburg, and numerous other southern communities had black militia units. The New Orleans militia proudly served the confederacy during the first year of the war, than forcibly swore allegiance to the Union after Admiral David Farragut and General Benjamin Butler captured the city in April, 1862. In the small town of Canton, Miss., is the probably the most unusual confederate monument in the nation, dedicated to black confederates. Erected some time before the turn of the century, the handsome granite obelisk honors the "loyalty and service" of the blacks who served in Harvey's Scouts, a crack cavalry unit that distinguished itself while opposing general Sherman's march through Mississippi and Georgia. "Had the confederation met Lincoln's first Proclamation of Freedom by an unqualified liberation of every slave in the South and a proffer of a homestead to each of them who would shoulder his musket and help achieve the independence of the confederacy, it is by no means unlikely that their daring would have been crowned by success. The blacks must have realized that Emancipation, immediate and absolute, at the hands of those who had power not only to decree but to enforce, was preferable to the limited, contingent, yet unsubstantial, freedom promised by the Federal Executive." "To make soldiers of our slaves is the most pernicious idea that has been suggested since the war began. The day you make soldiers of them is the beginning of end of the revolution. If slaves will make good soldiers then our whole theory of slavery is wrong." "The most liberal calculations could not give them more than 64,000 men. Over 3,000 negroes must be included. They were clad in all kinds of uniforms, not only cast-off or captured United States uniforms, but in coats with southern buttons, state buttons, etc. These were shabby, but not shabbier or seedier than those worn by white men in the rebel ranks. Most of the negroes had arms, rifles, muskets, sabers, bowie-knives, dirks, etc. They were supplied, in many instances, with knapsacks, haversacks, canteens, etc., and were manifestly an integral part of the Southern Confederacy Army. They were riding on horses and mules, driving wagons, riding on caissons, in ambulances with the staff of Generals, and mixed up with all the rebel horde. The fact was patent, and rather interesting when considered in connection with the horror rebels express at the suggestion of black soldiers being employed for the National defense." One of the members of Stonewall Jackson's immediate circle of intimates was his chief cook and valet, Jim Lewis, who reportedly cried uncontrollably during Jackson's deathwatch. Lewis was held in such high esteem by other members of Jackson's personal entourage that he was awarded by confederate leaders the high honor of escorting Jackson's famous horse, "Little Sorrel", during his beloved commander's state funeral in Richmond, 1863. In Arlington National Cemetery, on the grounds of what was before the Civil War the Lee family estate, there is an impressive memorial to the Confederacy. 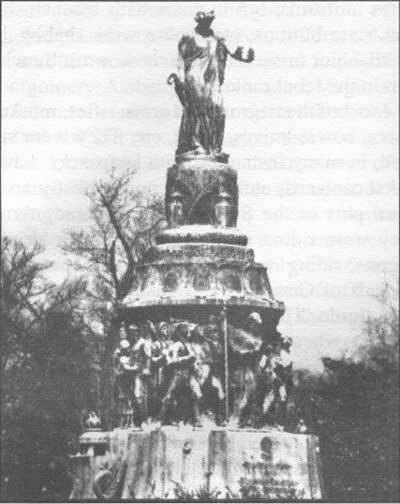 It is Arlington's largest monument and was unveiled to the public in June, 1914 on the 50th anniversary of the founding of the cemetery by the federal government in 1864. The memorial is rich in symbolism and substance. Standing atop the thirty-two foot structure is a large-than-life figure of a woman representing the South. Her name is "New South" and her head is crowned with olive leaves, her hand extends a laurel wreath toward the South acknowledging the sacrifice of her fallen sons. Her right hand holds a pruning hook resting on a plow stock. These symbols bring to life the biblical passage inscribed at her feet: "And they shall beat their swords into plow shares and their spears into pruning hooks." Below the statue is a circular frieze of figures illustrating the effect of war on both races. Among these bronze representations of southern patriotism are three blacks: a soldier (in uniform and armed), a mother, and a small child. Their prominent negroid facial features are easily noticeable, thus there can be no doubt about their racial identity. The sculptor, Moses Ezekela graduate of the Virginia Military Institute who fought in the Battle of New Marketplaced the blacks side-by-side with other fighters and families of the confederacy because he wanted the memorial to be a truthful representation of the southern Civil War experience. Over the years black Americans have continued to demonstrate their deep-seated patriotism and love of country even when their country had no love for them. The U.S. Army was not racially integrated until 1948 and the Korean War became the first time blacks and whites fought together in the same units. During the 1960s, when the civil rights struggle was raging throughout the South, with blacks being beaten and killed for simply demonstrating for the purpose of securing their basic rights as citizens, black men still fought and died in the jungles of Vietnam in the tens of thousands and I, for one, have never heard of a black American who burned his draft card or who fled to Canada to avoid military service during that violent and divisive era. The colony of Jamestown was founded in 1608 and the first blacks arrived on these shores from Africa in 1619. Since that time African-Americans have become an inextricable and glorious part of American history. There is no comparable experience in any other country in the world.